Why Must I Not Love You? Who can resist this cover? This would be a Komondor, the largest of the Hungarian dog breeds? Known as the "King of the Working Dogs" the Komondor are perhaps one of the most unusual looking dogs in the world. After a bath this dog can take three days to dry. Why is there a dog on the cover? I have no idea. 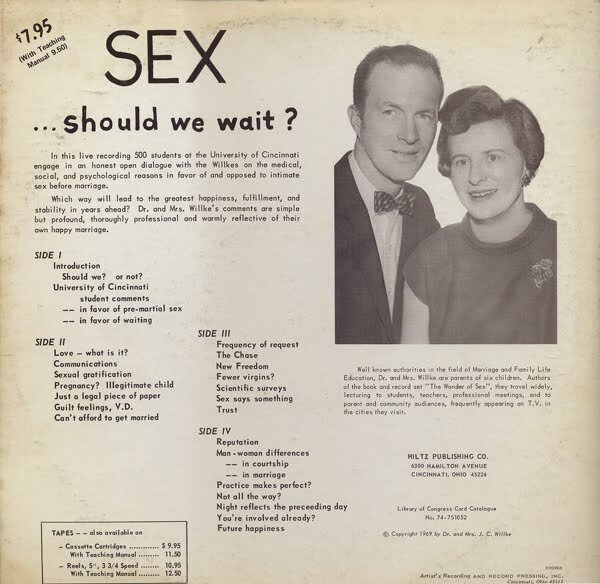 The song titles, thankfully, are translated on the back cover (although the number of tracks on the record and the song title number do not match). 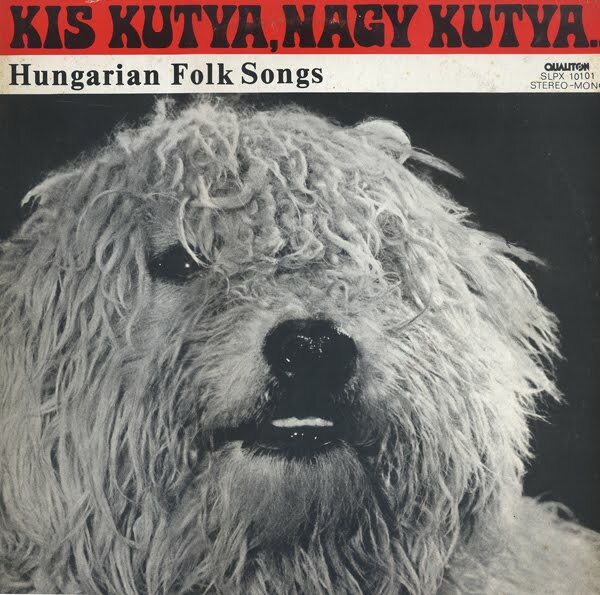 One song, on the B side is titled "Little dog, big dog". That's it for the dogs songs. Other song titles are humorous. Titles include: My sweetheart is chic, Who knows why you have gone away?, Crying is not worthwhile, Maidens, maidens, maidens in the village, You are my woman, There is a ditch and there is a pit, The snow has covered the road, I don't need that, My boots are wrinkled and The raven is croaking... yes... My boots are wrinkled and The raven is croaking. 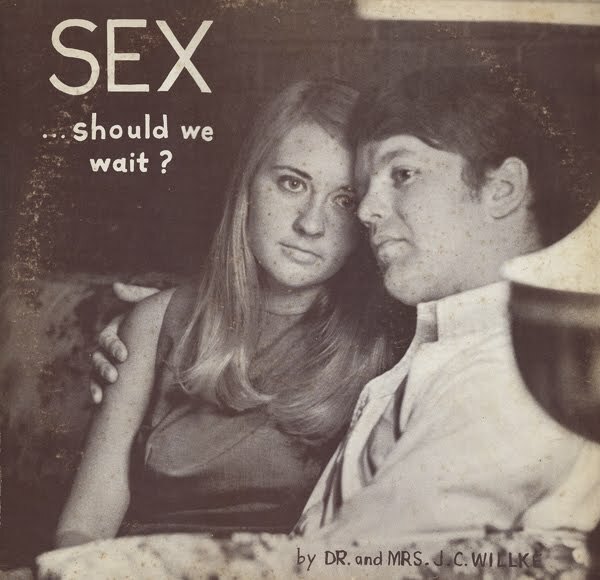 This curious cover attracted me to this album. I'm still trying to ascertain the meaning. Why is three a crowd? OK... it's a romantic evening and three's a crowd. But why another girl? Maybe the guy thinks that three is a good idea. Or his date is OK with three. Anyway, I normally call Somerset albums "budget"records. But aside from the "budget" cover idea... the music is quite good. The stripped down jazz makes me want to find an old fashion lounge to sit back in a comfortable chair and sip an adult beverage while these guys play. 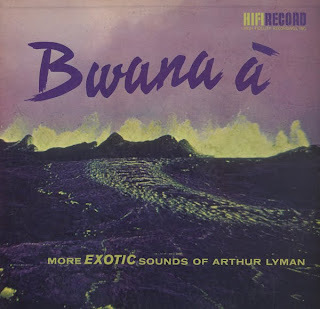 From the back cover notes: Bwana A was composed by Arthur Lyman and John Kramer for boss and good friend Henry J. Kaiser. Bwana A, literally interpreted, means something like "boss friend." 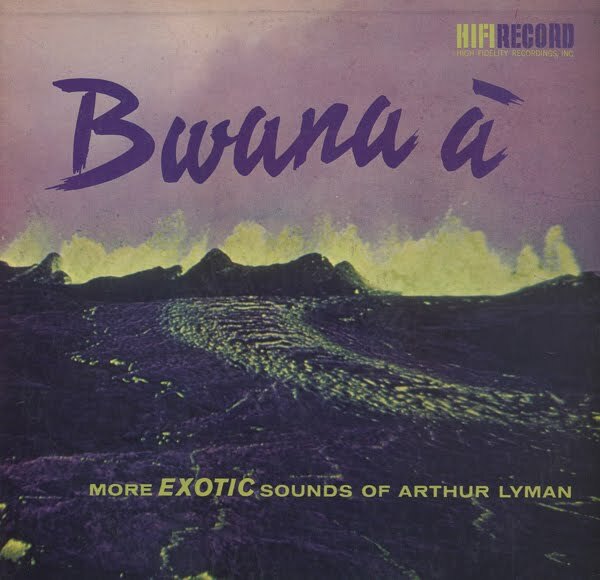 Another stellar project (his fourth release) from one of the kings of exotica, Arthur Lyman. It is interesting to note that Lyman albums were recorded live, without overdubbing. He recorded in the aluminum Kaiser geodesic dome auditorium on the grounds of the Kaiser Hawaiian Village. The auditorium offered acoustical qualities that add a reverberation to his work that help give it a that far away other world quality. Lyman recorded after midnight to avoid recording unwanted noises, but apparently, on occasion you can hear the dome settling at night when it cooled off. There is a photograph of the auditorium on the back cover of this album along with a more technical explanation of the acoustical qualities. 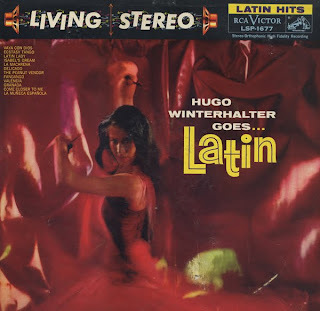 Occasionally, on this blog, I talk about the exotica musical form taking you on trips to fantastic worlds. Apparently, in 1959, RCA understood this (saying as much on the back cover). They (Gerald Fried) created this world with a few interesting tricks. Overlaying crowd noises, adding odd little sounds and recording music that sounds like it was recorded in the distance (or in the next room). 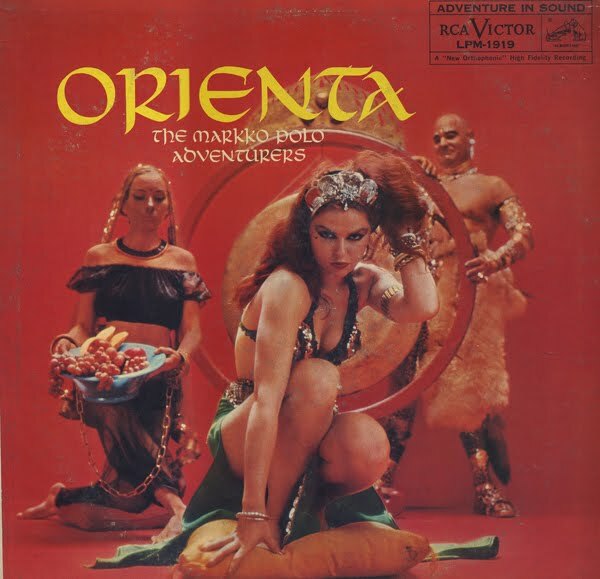 This album was arranged by Gerald Fried who is know for arranging music for films and TV, including Star Trek. Apparently Fried went to high school with Stanley Kubrick and composed scores for his first four films. 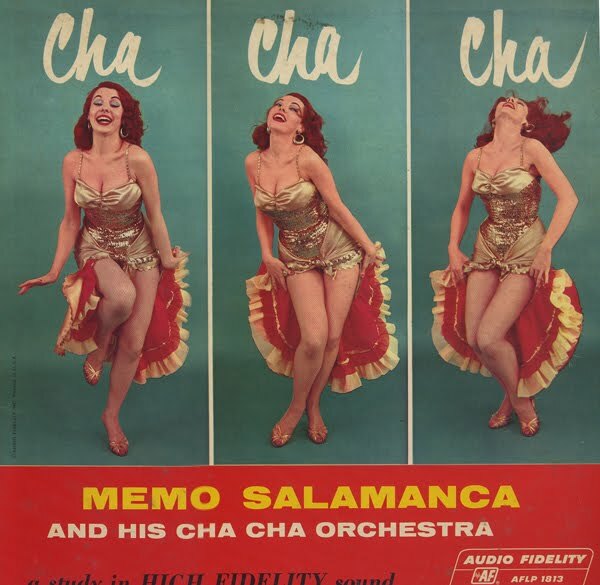 One blog covering this work mentioned that some folks may consider this project a "parody" of exotica. To me, 1958 seems a bit early in the timeline to be doing a parody when the form only received it's "label" in 1957. Who would get the joke? In fact, exotica as a whole, could be considered a parody of world/folk music traditions. 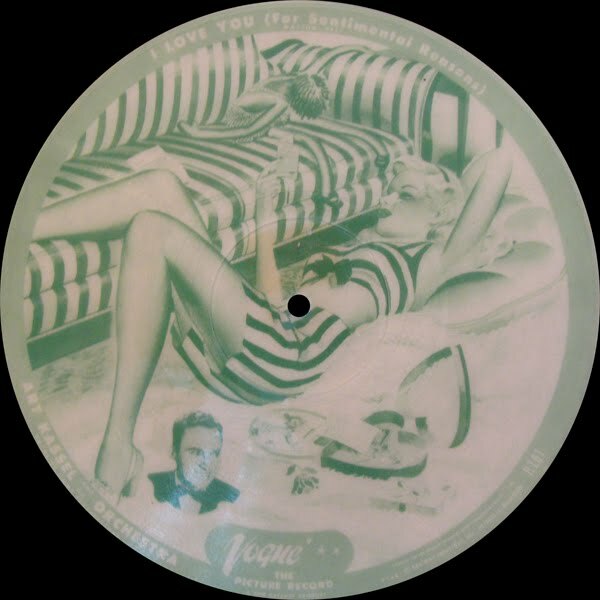 Could it be that Fried just wanted to make an "exotica" LP and this is what he came up with? Whatever is the case, this record is a great addition to your collection. From Billboard - February 29, 1964: Another strong album for the stereo-conscious good music fan. The album is filled with continental charm of Italian melodies played by an large orchestra that includes strings, concertina and guitars. Close your eyes and your listening in Italy to tunes like "Solo Mio," "Anna," "Non Dimenticar" and "Arrivederrci Roma." 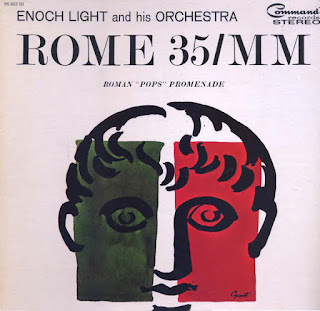 This record was made after Enoch Light sold his label to ABC in 1965. In 1968 ABC was still using the Light's gatefold jacket design. That's amazing and a good thing because there is enough space on the inside of the book-fold to explain who the Ray Charles Singers are. It is a long and complicated story. Apparently the folks (featured on the cover) are the actual group members. Most of whom, after a recording session, ran out to the airport to have a photographer set up this photo. From the jacket notes: But on the bus back to town, they were a disgruntled group of girls. All that preparation and you can't even see their faces! Ray Charles is seen on the cover. He is the fellow wearing the cap. 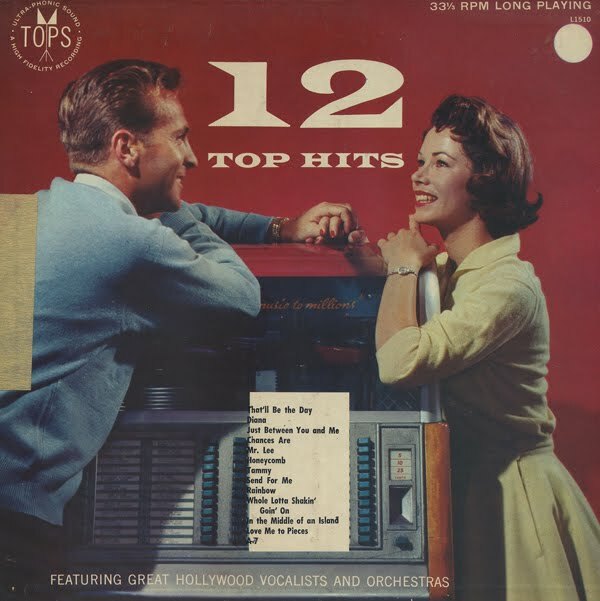 The music is easy listening with touches of 60s pop that help make most of the tracks interesting (if you are into 60s easy listening... that is). Apparently a rare promotional record from The Aluminum Company Of America. According to the jacket notes ALCOA decided that they needed to make "the home-buying and home owning public more conscious of the need for better housing and more willing to invest the necessary funds to obtain better housing." I'm not kidding, this is how it reads. 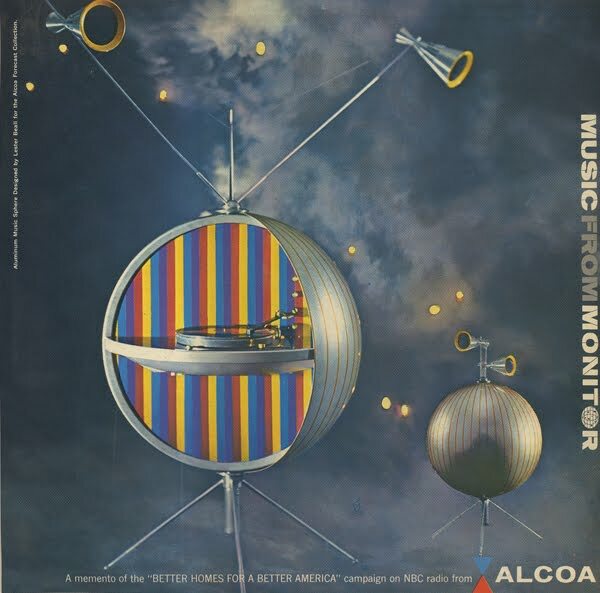 As a part of ALCOA's project to make people feel horrible about not living in an aluminum sided house... they lunched a radio program in 1959 on NBC called "Monitor". They used this program as a platform for all sorts of "experts" to spew about "housing as they see its problem and its effect on American life." Man... Fortunately Monitor also featured music to help perk you up from the guilt you must have been feeling for living in a brick house. 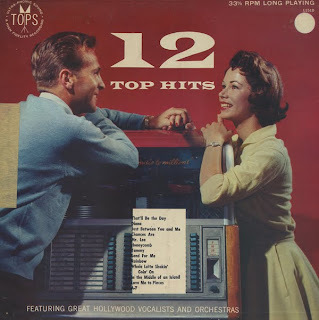 And some of that music is featured on this LP. 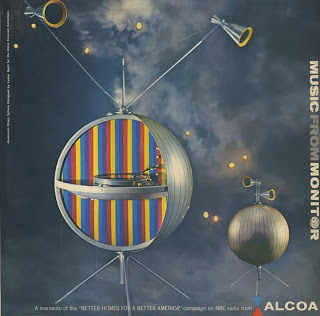 I must admit that ALCOA bought themselves an amazingly cool Space Age/Atomic Age record cover! "Aluminum Music Sphere Designed by Lester Beall for the ALCOA Forecast Collection. Now this is a great use of aluminum! Love it! The music is not pure space age or as cool as the cover looks but Wide Wide World is awesome sounding along with Sid Bass's How High Is The Moon (a song from this Sid Bass LP). I would call the LP a mix of bachelor pad and easy listening. Overall, not a bad collection with a few dull tracks to give your time to ponder why everything you see in your house is not made out of aluminum. Love the cover, don't understand the lyrics... grooving on the sound. There are many fun and varied pop tunes with a 60s flare on this set. 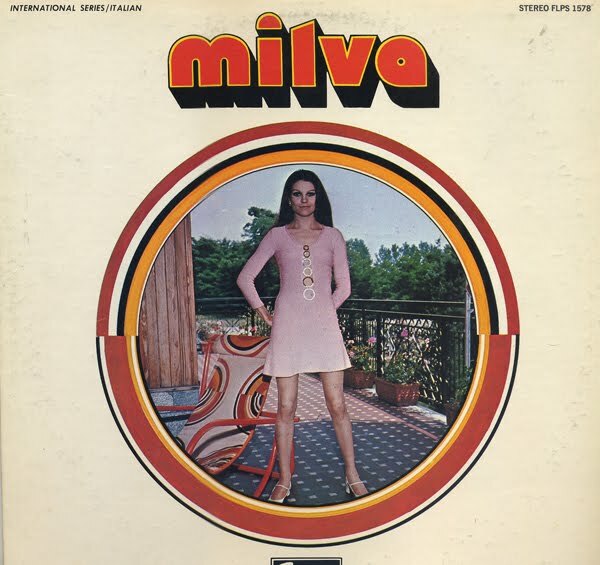 I found Milva on wikipeida. Maria Ilva Biolcati. She is fabulously popular and has made countless albums. 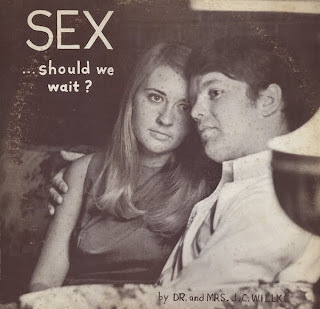 This record has it all that includes a weird looking cover and the number one track on the A side titled Adolf Hitler. On further investigation, apparently Luca wrote an entire piece of music that featured all the most "popular" conquerors. Including Hitler. Very little information can be found online about this project. 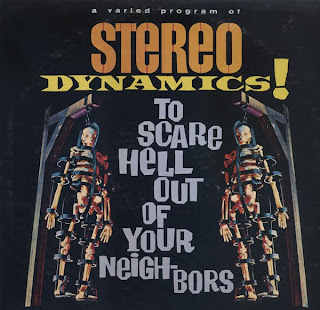 The back cover states: To Test Your Stereo Equipment of Scare Hell Out of Your Neighbors. I'm not exactly sure what the hell Somerset was up to... Surely they just wanted to make a buck packaging songs they paid nothing for. The second track on the A side is Fire Goddess by The Surfmen is a very cool track is followed by a scary organ track and then.... WTF... La Paloma? An exercise in musical contrasts! I get it! 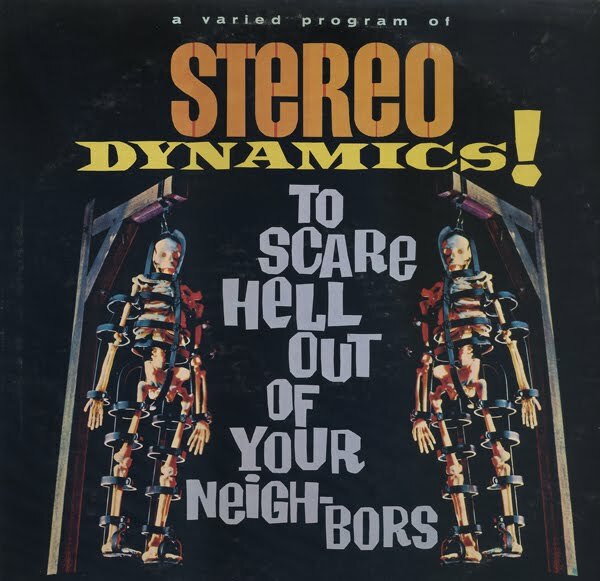 Scare your neighbors! LOL! Arguably one of my more rare local recordings I've found. A two record set made during a talk at The University Of Cincinnati, Ohio. Terrific cover with lots of copy on the back describing how to do the Cha Cha. However, there is no information on Salamanca. Apparently, Salamanca's first name was actually Guillermo. He died in 2008 at the age of 83. Nice set that is as perky as the cover art. The vocals seem to have had a little reverb added giving the record an interesting sound (for the period). Wonderful spicy cover from the RCA art department created to hide a not so spicy record. 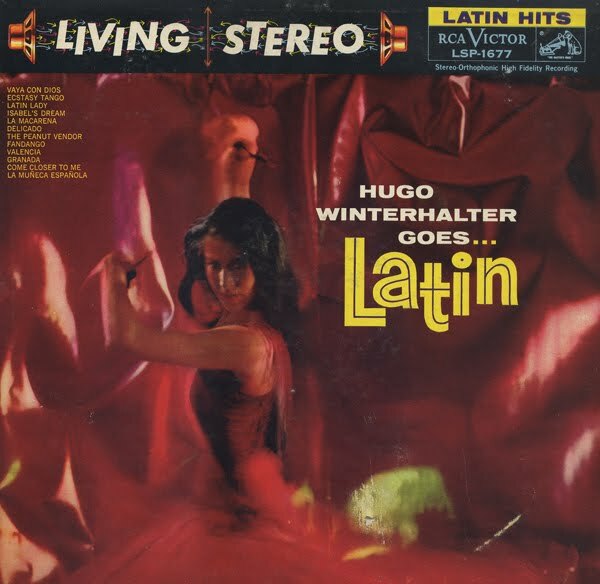 Much of the album is Winterhalter's struggle to find the "Latin" groove. 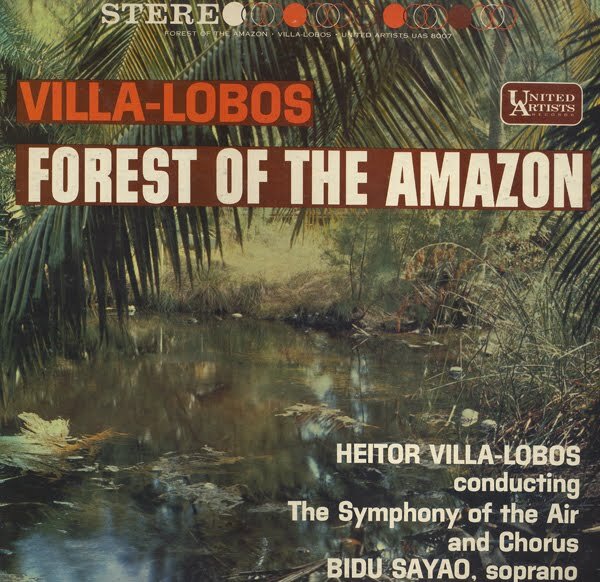 United Artist Records 1959 release of Villa-Lobos work which was based on, Green Mansions, a novel and MGM movie of the same name. 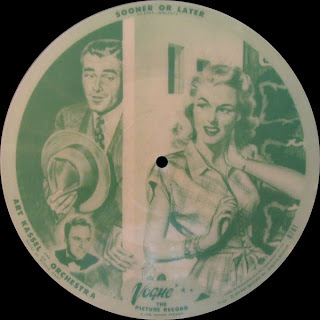 Apparently the movie producers wanted Villa-Lobos to score Green Mansions, but there were problems with the score due to Villa-Lobos writing music for the novel rather than the film adaptation or he used an early version of the script. There were problems in editing and Bronislaw Kaper completed the work on the film. 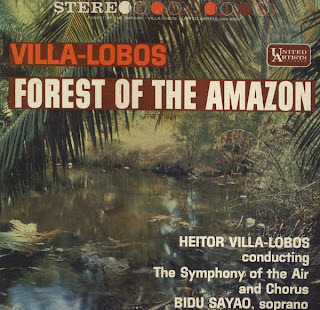 Villa-Lobos edited his full score into a cantata and that is what is presented on this record. Shy of exotica but a nice piece of music with added excitement from Bidu Sayao, a famous Brazilian Soprano. 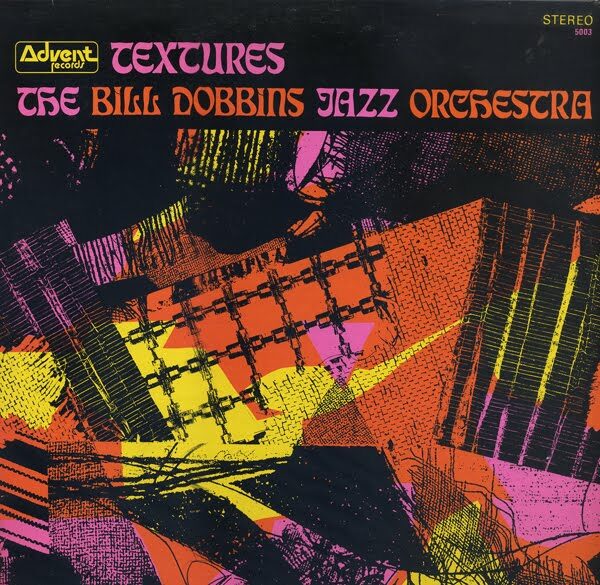 According to the jacket notes "Textures" was commissioned by The John F. Kennedy Center for The Performing Arts in 1969. I don't normally look for jazz LPs, but I was drawn to the funky 70s cover art. Apparently this LP is obscure and I found just one other copy online. 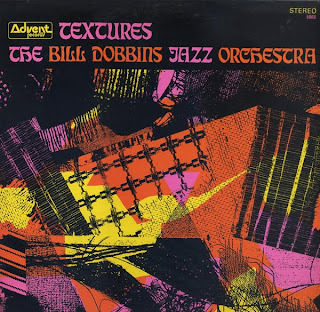 I also found a Bill Dobbins, jazz composer and pianist online. This work in not on his list of "recordings". But there is a photograph of him printed on a slip sheet found inside the jacket. Apparently this record was made when Dobbins was in his mid-20s. Textures is the "A" side, however, by way of posting a sample, I'm going with "The Balcony", the second track found on the B side. "The Balcony" was inspired by The Kent State University shooting, according to the jacket notes. 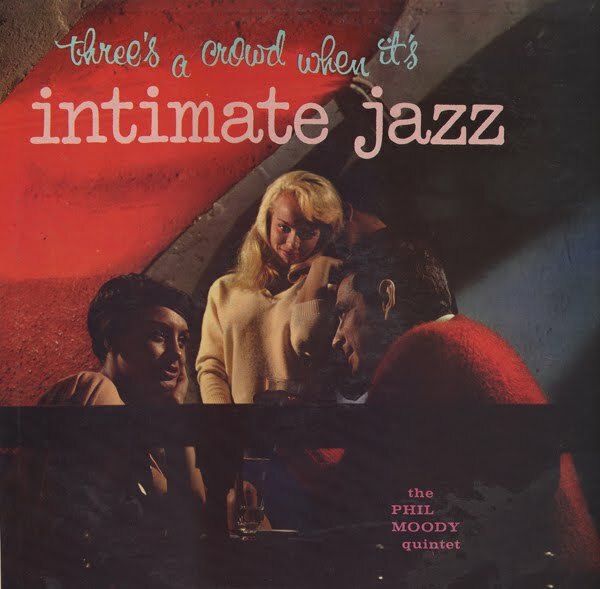 And, at the very least, this song seems to have made a big impression on Chris Colombi, Jr., Jazz Critic for The Cleveland Plain Dealer (author of the jacket notes). 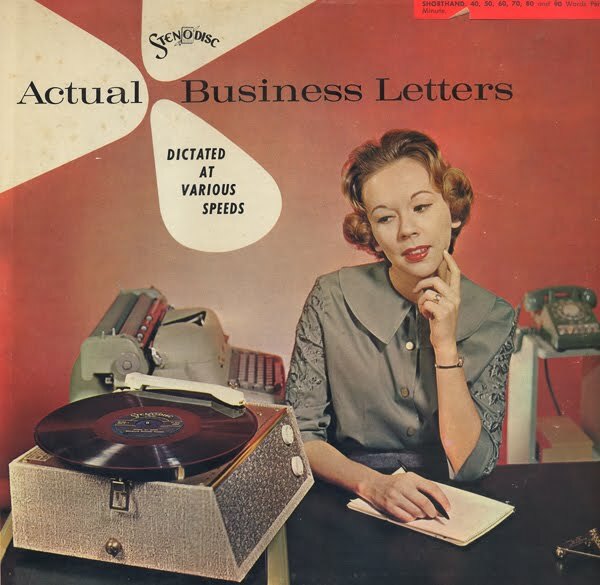 Tops overprinted this stock cover with titles, releasing more than one mix of titles using the same catalog number. The "A-7" at the bottom of the list denotes, I guess, the part of the "run" to include the particular mix of track titles featured on the LP. Light strikes again with incredible sound. 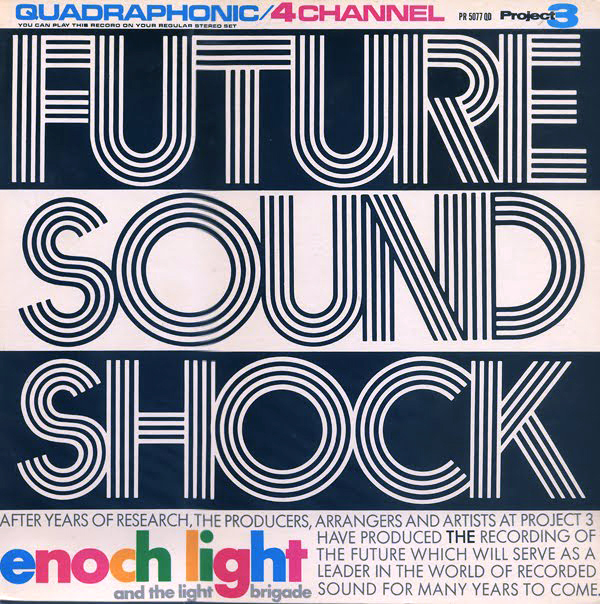 "Future Sound Shock" refers to the engineering which, in this case, is a Quadraphonic pressing (the stereo catalog number: PR 5077 SD). Even though this record isn't a Command project, the jacket is still a Light-styled book-fold that features enough information about Project 3's path to Quad sound to fill the inside covers. 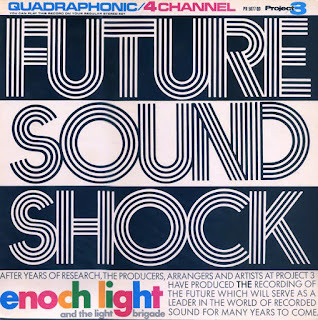 Enoch Light was one of the first to create music using 4 channel mixing. By today's standards, the title is a double take. Additionally the jacket notes, when listing "tired" people refer to a housewife as "fagged-out". 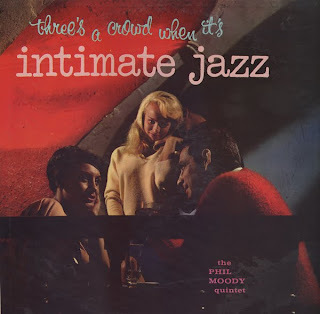 The music is mood spiced with a touch of jazz. Song Of India plays unlike the rest of the set and smacks of exotica. Kay's Octet musicians include: Eddie Kay, Pete Carpenter, Rudy Cangie, Ramez Idress, Bob Nelson, Bill Nader, Carl Maus, Joe Lichter and Gene Garf. This is a split LP, featuring more "traditional" sounds on the A side (the Akoni Lani side) and a more of a "lounge" sound by Danny K Stewart on the B side. 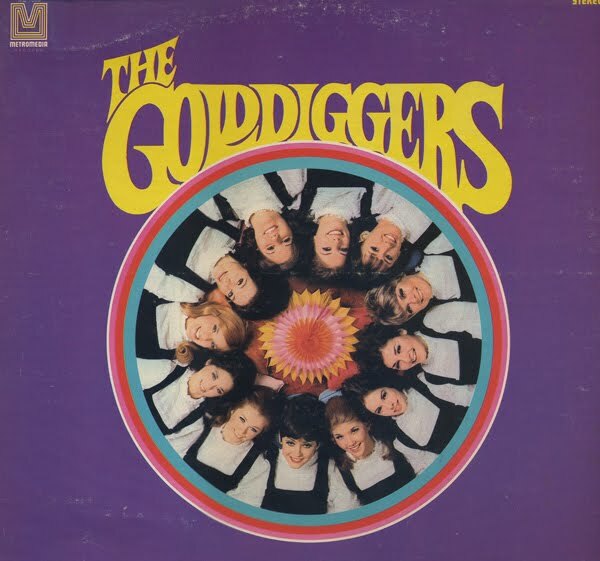 The Golddiggers were an easy-on-the-eyes girl group created as back-up for Dean Martin on his variety show. According to jacket notes attributed to Dean Martin, Greg Garrison producer of Martin's show put together this group of ladies in 1968. 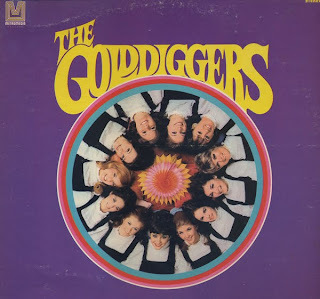 From the back cover: In the spring of 1968 Greg Garrison, the producer of my television show, got a notion to put together a group of 12 beautiful young girls who could sing and dance the songs that were popular in the 20s and 30s. He called them "The Golddiggers." After he had shaped the act, he invited me into a rehearsal studio to look and listen. They were so fresh and talented I just sat there wide-eyed... I looked like the guy who jumped on his bicycle and discovered there was no seat. After several appearances on my show, they were such a hit I asked them to star on my summer show. The did, and they have been re-signed to star as my summer replacement this year too. What I love about these kids is that they are real conscientious. One time they were unhappy with a performance they gave... they locked their dressing room door and had a cry-in. I appeased them of course. I knew they were just kids, so I gave each of them a set of crayons and a Peyton Place coloring book. I know one thing, the Golddiggers are going to go far because they are talented and believe in themselves, and I can't tell you how happy I am to have them around. I love youth... the oldest thing on my show is my scotch. Crayons and Peyton Place coloring book? Dean... you are so BAD!!! LOL! This is a great 60s easy listening album. Very light left-over space age pop with that campy TV show feel. The girls have a website. 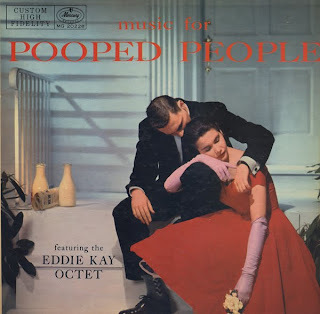 Songs from this LP will play for you when you load the homepage.